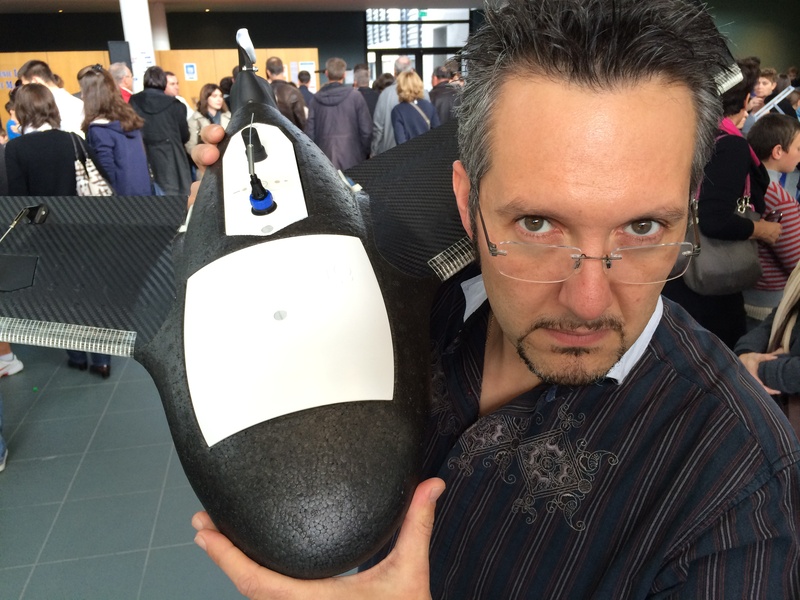 Omar-Pierre Soubra with the Gatewing X100 UAV. While not the latest model—that would be their UX5—the Trimble Gatewing X100 drone was drawing a lot of attention at Saint Malo Mini-Maker Faire. Capable of autonomous operation—all the way from launch through to its landing—the drone is designed to map terrain it’s overflying. The Gatewing’s GPS (left) and 2.4GHz radio (right) antennas. The Gatewing’s aileron control rod. The drone has a polystyrene body—with carbon fiber reinforcing on the leading edge of the wings and the wing tips—and houses a controllable camera which allows a 3D model of the underlying terrain to be built up using photogrammetry. Alongside the camera the drone carries a 2.4GHz radio, a GPS unit, an accelerometer and a gyroscope—it also has a Pitot tube mounted on one wing. After defining the area to be mapped inside Google maps, the drone is launched from a sling, and will return autonomously after its reconnaissance flight to land flat—which explains to rear-mounted foldable propeller. Interestingly, one of the major uses for the drone is to calculate volumes; a lot of open pit quarries are using it to to figure out how much rock has been removed at the end of the day, and municipalities are using it to overfly their trash heaps—and work out how much volume of trash has been added rather than taken away. Omar-Pierre Soubra—from Trimble and here with the drone in Saint Malo—commented that the legality of operating the drone varied wildly between countries. For instance here in France you needed a full pilot’s license and you must file flight plans and other paper work, whilst in other countries regulation was much less strict.